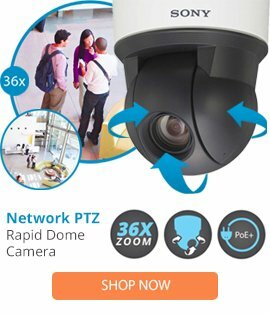 The IRHW75TN is a 7” network ready wall mount vandal resistant dome housing from Videolarm that is able to provide high quality camera protection for PTZ IP network cameras w/o electronics. The IRHW75TN dome housing comes with high compatibility for most major brands of network cameras, a .22 caliber bullet resistance, a wall mount, an 11” thick polycarbonate tinted lower dome, and a vandal resistant rugged cast aluminium top. The IRHW75TN dome housing also features multiple protocol support, a .125” cast aluminium body construction, a wall mounting design, plus RoHS compliancy, and UL listed. This camera housing is able to provide high camera protection, and can easily be used in a large range of installations. Available with fixed camera bracket, MCL – 7.5"
14.7 x 8.2 x 14.5"